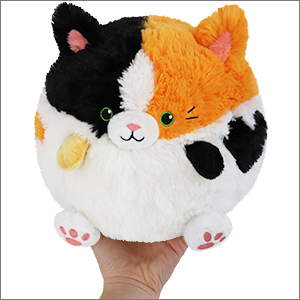 Mini Squishable Calico Cat: An Adorable Fuzzy Plush to Snurfle and Squeeze! Did you know the Calico Cat is an ancient nautical protector, accompanying sailors on vast ocean voyages? Truth! They're supposed to chase away storm clouds and ghosts...which doesn't explain why we still have both of those things at Squishable HQ. Maybe our Calico Cat actually draws them in? Hmmm, she's certainly able to summon lots of hugs and snuggles, seems plausible! Indeed!